Above is Grandeur Of The Seas as she sails between the piers at the outer harbour of IJmuiden. This picture was made at the 5th of july in 2003. Grandeur Of The Seas was, when she was built, the biggest ship of Royal Caribbean Cruise Line, soon a little bit renamed as Royal Caribbean International to show the company had more to offer than just Caribbean cruises. She was part of a large expansion program called 'Vision', that started with the Splendour Of The Seas and Legend Of The Seas. Some people refer to these ships as sisterships in the same class as the latter four, but with so many differences I can not agree with that. The first two ships are somewhat smaller (69.000 tons) and their external looks are very different. The 'Vision'-ships were named after the exteriour of these ships, that consists of glass for half of it. So it gives the passengers lots of seaviews and a great feeling of space. In recent years with new classes, Royal Caribbean continued to design ships in this way. 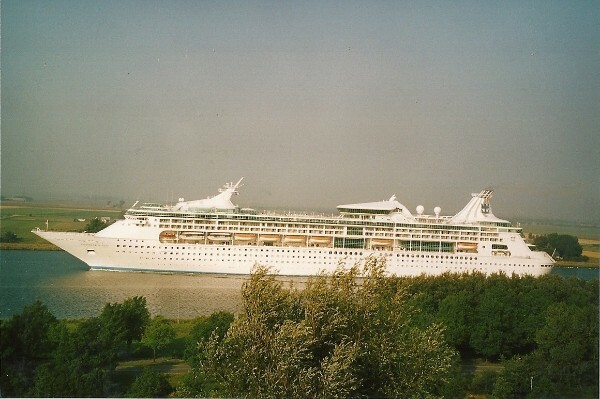 Grandeur Of The Seas was delivered to her owners on the 20th of november 1996 and her homeport became Monrovia, Liberia. The ship features an on-board casino, Casino Royale, on Deck 5. There are also eight themed bars and lounges, including the pool deck bar, South Pacific Lounge, Singin' in the Rain (a children's themed lounge), the Schooner and the Viking Lounge. The open atrium, called the Centrum, stretches from deck 4 to deck 10. An outdoor pool is found on the top of deck 9 along with four whirlpools, two on the starboard side and two on the port side. On the same deck is the indoor Solarium area with its own pool and two additional whirlpools, one on starboard and one on port. A jogging track can be found on deck 10. Her looks were somewhat different from earlier RCCL ships, because the crownlounge was not built around the funnel. This is strange, because Royal Caribbean started to add this lounge at the first ships, because they found the funnel the ugliest part of any ship and because of that something had to be added to make it more nice. Also, the 'ugly' funnel was placed so well aft that it just could have been placed behind the ship. This design give these ships a beautyful sleek and long look and it makes them also directly recognizable. In my opinion, these are among the most splendid looking modern cruiseships in the world. Below is Grandeur Of The Seas is very green surroundings near Spaarnwoude at the Northsea Canal. This picture was taken at the 10th of august 2003. Grandeur Of The Seas was the first of four. 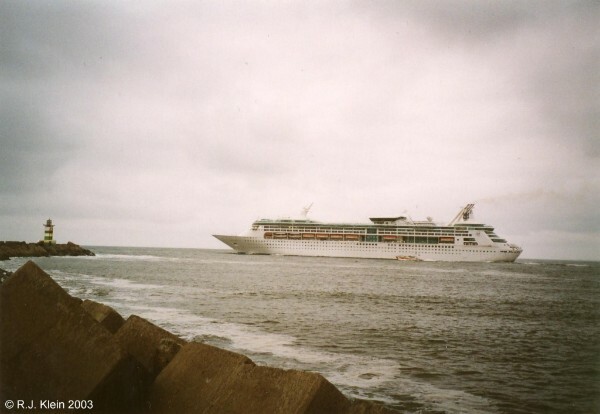 She was (with 74.000 tons) somewhat smaller than the 78.000-ton Rhapsody Of The Seas, that was delivered five months later, followed by Enchantment Of The Seas in july 1997 (she was as big as Grandeur), and the last one Vision Of The Seas that was again as big as the Rhapsody. So in size there are some differences, but in external looks these ships were practicly the same. Grandeur sailed her first cruise in the Caribbean on the 14th of december 1996, the day after she was named in Miami by her godmother, Aviva Ofer, wife of Israeli shipping magnate Sammy Ofer, and mother of Eyal Ofer, a member of the Royal Caribbean Board of Directors. In november 2001 her homeport changed to Nassau, Bahamas together with some other Royal Caribbean ships. I do not know this for sure, but I guess this had something to do with political unrest in Liberia at the time. Her Caribbean cruises were slightly underbroken by some Northern European cruises in 2003, but she was replaced there by the bigger Jewel Of The Seas and resumed Caribbean cruising. Her life has been very steady with not many problems, only a little bump against a pier in Costa Maya, Mexico in april 2005. This 'kiss' got her a hole in the head but luckily nobody was injured.